For the fourth time, the Order Trade Fair area 30 in Löhne was held from 13.-18.09.2014. With over 10,000 trade visitors from 43 countries, the Concept Kitchen found a large and diverse audience. Naber presented the versatile use of the Concept Kitchen in a real end user situation: from the minimal utility room - also in combination with build-in kitchen elements - to the spacious living and lounge area for several people. For the first time we also presented new shelf modules and functional elements such as drawers as near-series prototypes here. Parallel to the area 30, the Concept Kitchen was also to be seen at the design fair 100%Design (17.-20.09.2014) within the context of the London Design Festival, the largest contemporary design event in Great Britain, which was opened this year by the design guru Philippe Starck. Not least due to the innovative design of the kitchen and interior furniture, the company Naber was recognised here as a trend scout and implementer of exceptional product strategies. The Concept Kitchen was very puristically presented in London in kitchen use with transition to the living and working area, and delighted interior designers, specialist dealers and designers and lifestylers alike. The ORGATEC - modern office and object in Cologne is the world’s leading trade fair for equipment and furnishings of offices and facilities. Thus, from 21.-25.10.2014 Naber presented brand new shelf modules here that are especially suited for office and shop design. The fair presentation combined kitchen, living and work space, whether very specifically as an office kitchen, or as neutral furniture for office and shop: as Concept Office! The versatile concept of functional and high-quality interior products was convincing and already generated lively ordering activity at the fair, which was attended by about 50,000 trade visitors this year. At the start of the year we were represented at the blickfang in Stuttgart. Now from 28.-30.11.2014, Naber has also exclusively presented the Concept Kitchen at the blickfang in Hamburg! 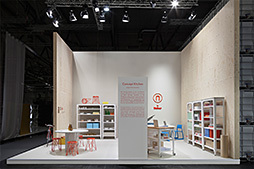 The Concept Kitchen is already familiar to the Hamburgers as it was shown in the context of the blickfang selected where Rossana Orlandi nominated Kilian Schindler for the young designer promotion scheme. This time Naber presented the furniture in production, extended by its new elements - with complete success!